AT&T released a tool on Tuesday to help you measure the money and greenhouse gas emissions your business could save by taking actions such as cutting down on business trips. The Carbon Impact Assessment Tool takes into consideration the overall size of a given company including its number of employees, as well as travel plans. It then lets you know what you can expect to save by utilizing digital collaboration and communication tools. 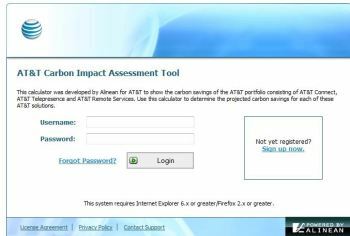 Of course, AT&T is hoping you'll use their tools, which is why they built the carbon calculator. But you can always use this to figure out what solutions work best for you and your business. In these lingering lean times, for instance, you could save by cutting down on travel and using online collaboration services rather than having to fly everyone around the world to meet in the same conference room. Of course, reducing greenhouse gas emissions is good for business, as it tends to mean reducing costs as well. And knowing exactly what actions will lead to specific emissions savings will help you prioritize and tackle those simple steps that can have a big impact. The Carbon Impact Assessment Tool displays the energy and cost saving results in infographic-like terms, such as number of cars removed from the road, trees that no longer need to be planted to offset emissions, or houses worth of energy use avoided. There are a other online carbon calculators for business that will either try to sell you services or offsets to reduce or make up for your company’s cabon footprint. Orange Business Services will calculate your carbon footprint and then compare that to the reductions available by choosing their services for cloud computing, telepresence, or mobility. These Flash-based tools don’t require registration as the AT&T tool does, but they won’t work on browsers that don’t support Flash (including on the iPad). Two companies that sell carbon offsets and will calculate how many you need to buy are JP Morgan Climate Care and Carbon Footprint. You can use their calculators for individuals without registration, but the Carbon Footprint business calculator requires signing up for an account. Ilie Mitaru is a culture and business journalist and an occasional entrepreneur. He is the founder of an alternative business magazine, Stake, set to launch this fall. Follow him @iliemit.